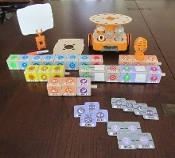 Choose from individual KIBO robot kits, or combine them to make your own classroom packet. Student workbooks, curriculum, assessments and KIBO training for teachers is also available. Please e-mail us to find out more about those options.